One of the reasons I prefer Linux over Windows is the ease of package management. Apt, Yum, and Pacman depending on your distribution (Debian:Ubuntu, RedHat/Fedora or Arch) just seem much more logical than the Microsoft App Store or even Apple’s software store. I don’t use the GUI interfaces available on any system if I can carry out the same goal from a terminal. I realize all these systems have a “terminal/Command line” available, but a lot of users have grown accustomed to a graphical point and click method. I haven’t, nor do I enjoy navigating around the screens pointing and clicking – it seems like a waste of time. PowerShell on the Windows System is an exception. I’ve gotten used to using the Windows command prompt and netshell when possible, but always felt that neither lived up to the power of BASH. PowerShell has grown and developed into a useful tool that many Linux users would find worthwhile for system administration and troubleshooting functionality. When you add in the Chocolatey package management tool/repository you start to see potential for a more Linux-like work flow. 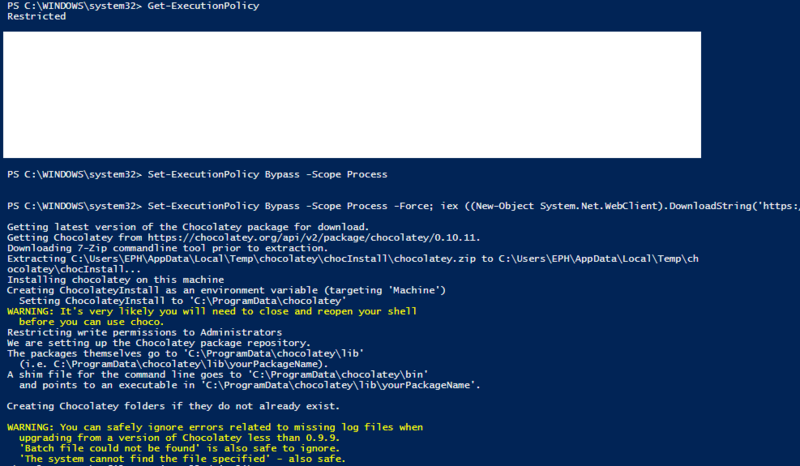 I see that there is also a GUI available for Chocolatey for any who prefer, but installing packages via PowerShell is fairly simple – as is searching and listing available packages. I doubt i’ll abandon my Linux machine just to run PowerShell, but I think it’s beneficial to know how different Operating systems function and carry out similar tasks you might deal with in Linux. “list, search, info, and install” are the commands I use the most when using Chocolatey. The “info” command is extremely useful in providing information on the application you may consider installing.